Many claims about being Green and Sustainable, with an emphasis on walking and cycling and public transport. Not much detail on where housing and businesses will go,or the quantum, but, interestingly, first priority is a walk and cycleway around the foreshore from the existing path at Pyrmont near Jacksons Landing, under the ANZAC Bridge, to the Fish Market. Then on around Blackwattle Bay and along Pyrmont Bridge Rd to join the existing path around Glebe Point. The Govt is also asking for expressions of interest for a “Silicon Valley” reuse of the old power house building at White Bay. They have backtracked on an earlier statement that 16000 new dwellings would be slotted in. The elephant in the room is the possible exit portal for the West Connex extension to Anzac Bridge, in the old goods yard. No mention of this significant addition to the landscape. A transport plan is due for release soon [see plan obtained by SMH on January 12 in the Comments below], so we may see where new cycleways will go.They have signalled there will be new links across the goods yard from about Easton Park to Railway Pde or The Crescent in Annandale. The Dept of Transport is already planning a major upgrade of Lilyfield Rd – Leichhardt Council has a grant of approx $400K just for a study and design! 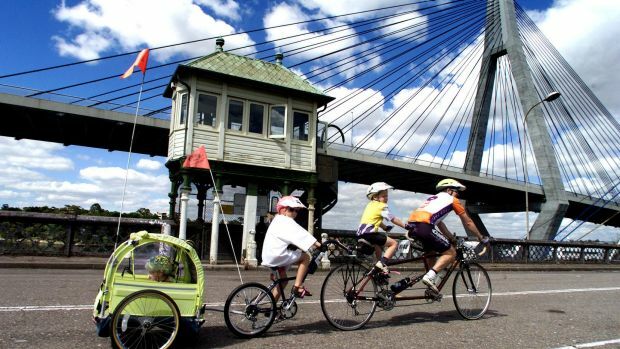 Artists impression on their website of a tram across the old Glebe Island Bridge have raised hopes for reuse of this desirable route into the city for cyclists, avoiding the long climb over the Anzac Bridge. This photo was taken in 2005 when the bridge was used for the Anual BNSW Spring Cycle. What would you like to see come out of this project, bearing in mind it is a green fields site and the possibilities for something non car dependant and highly pedestrian/public transit orientated?